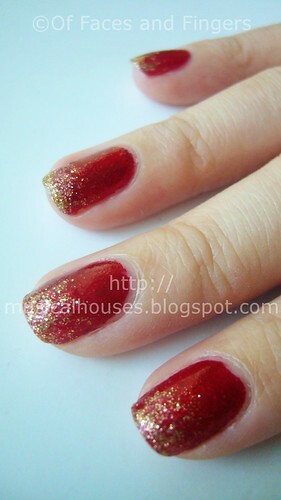 Chinese Lunar New Year Nails Using Color Club X'mas! Chinese New Year is upon us soon, and in the spirit of celebrating the lunar new year, I thought I'd dress up my nails for the occasion! I went with the predominant colours of Chinese New Year - red and gold. And in the spirit of festivities, the brighter and gaudier the colours are, the better they are! LOL! So, I hunted around in my stash for the brightest, blingiest red and gold nail polishes I could find. 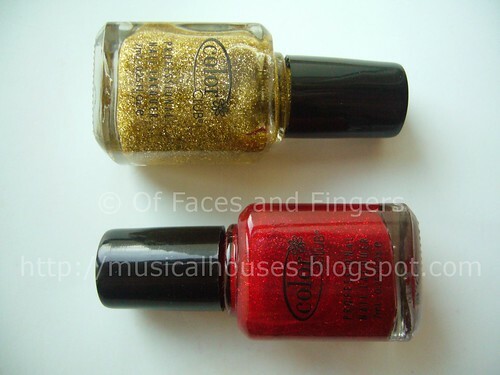 And lo and behold: I found these shades of red and gold glitter, perfect for the New Year! But wait! Aren't those from Color Club's last Christmas collection? If that was your reaction, you're sharp - those are indeed the latest Christmas polishes from Color Club's Enchanted Holiday seasonal collection. Specifically, that gorgeous red is Wish List Red, and the gold is Enchanted Holiday. But whatdayaknow, those Christmassy shades of red and gold just also happen to be just right for Chinese New Year! Who says you can't do bling on both occasions? So, since I had done the Christmas bling on my nails, I decided to do some Chinese New Year bling too. But since I had to wear this to work, the bling had to be a lot more toned down than I would have liked - I couldn't risk blinding my clients! Isn't that awesome? It makes me feel all in the mood for firecrackers, red packets and dumplings! And the best part is - you can actually replicate a look like that for Christmas, because you're using the same colours! Talk about killing two birds with one stone! Color Club Wish List Red is a gorgeous jelly-like red base with dense amounts of red glitter. I really like this one, it kind of reminds me a little bit of China Glaze's Ruby Slippers. Very pretty, and very eye-catching. Enchanted Holiday consists of gold glitter, but more sparsely distributed in a clear base. I also liked this one, and I think it'll be perfect for layering over other polishes. Both polishes were a litte bit on the thick side, which is not my usual experience with Color Club. It could just be that the base formulation was made thicker to ensure even dispersal of glitter in the polish. Still, they applied well, and dried fast. As with most glitters, you may wish to use two coats of topcoat instead of one if you want a finish that's smooth to the touch. I made do with just one, though. I'm so psyched about my nails, and I think they're a great way to celebrate the lunar new year! If you've been looking for nail colours for Chinese New Year, but can't seem to find any, Color Club's Wish List Red and Enchanted Holiday would be perfect. If, on the other hand, you don't celebrate Chinese New Year, but still wish it was Christmas, now you have the perfect excuse to continue wearing Christmas colours! Super cute and very suitable for Chinese New year :) Great choice of colour! Oh wow!! Those are perfect!! Wow those look so simple yet elegant! I have the same polishes and maybe I'll do it for cny too! Linda a combinação que fez! Gostei muito e vou tentar fazer!!! Oh my god! This definitely looks like the PERFECT lunar new year manicure, thank you so much for sharing! I've been racking my brain to find ideas, and this is amazing! Wow, Definitely love it! Perfect! This is such a pretty combination. I have those polishes. Will have to give it a try. Love these nails! the red and gold combination is fantastic for CNY! I'll try this next year!